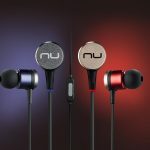 Carbon Fiber Material – the earphone uses carbon fiber material, which is exceptionally good at suppressing unwanted resonance; delivers high definition audio, minimal audio bleed, and rich musicality. Aerospace-grade Aluminum Alloy Mouthpiece and Chassis – for superior resistance to weather and deformation, and cancels the effect of accidental vibrations during your listening experience. Aperiodic Loading Acoustic Chambers – greatly reduces the pressure of the inner ear to achieve the same audio effect as open-air earphones, and completely eliminates ringing artifacts. 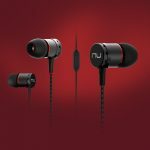 NuForce NE5 is designed for music lovers who care about sound quality. The earphone is made of expensive carbon fiber and aluminum alloy, and comes in a simple cylindrical shape. It features an ultra-lightweight, low resonance, and comfortable wearing experience with pure sound performance. The original aperiodic loading acoustic chamber design enables the earphones to have the spatial sound effect of open-air earphones, reducing inner ear pressure while listening. 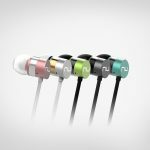 The earphones are also equipped with a microphone remote control, which makes it suitable for prolonged use for those on the move. 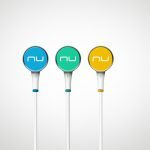 The remote control also allows users to receive calls while listening to music, and is another high-end choice of earphones for music lovers to use with their mobile phones or music players. In the field of acoustics, the harder the material, the more it can eliminate resonance and provide pure sound quality. However, the weight of metal materials adversely affects the wearing comfort of earphones. 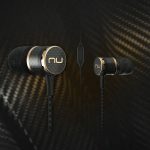 Therefore, NE5 uses an extremely lightweight yet highly rigid carbon fiber for the body, which can greatly reduce the weight of the earphone while ensuring excellent wearability. The chassis also features aerospace-grade aluminum alloy material, both of which are high rigidity, vibration-suppressing materials that allow for a pure, high definition, low-bleeding and richly musical sound performance. NE5’s unique aperiodic loading acoustic chamber design lies in the structure of its chassis. The unique opening allows the earphone to achieve the same effect as an open-air earphone, greatly reducing inner ear pressure while completely eliminating any ringing artifacts. Users will enjoy superior listening comfort with a wide sound stage and a more spacious sound field. NE5 comes equipped with a high-quality Φ6.9mm diaphragm. The mid-range vocals are prominent, with a well-balanced and distinct bass, mid and treble. It delivers a wide sound stage and a clearly defined sound field. The 1.2m cord is made of tangle-resistant material, so users do not have to worry about tangled cords.